THE GATHERING AWARENESS that humanity is going forward in Astral Travel, beyond our wildest dreams, creates a dilemma for our Conscious Mind. Once it is proven to us that we can "go out" - and there are beings and "truths" out there to explore (as the "X-Files" intro reminds us) - a question arises concerning how much time and energy we will allot to this most-important of activities. After all, experiencing reconnected "selves" and "realms" can become so distracting that a person might easily cease wanting to function in physical form at all. And that would be a big loss. There are huge advantages that a physical interface brings to the party. Most of us are not quite ready to drop our cocoon just yet. I was walking through a mall one day and noticed a fellow wearing a t-shirt that had a little box on it - the kind that comes on your screen when Microsoft finds something wrong in a program you are running. In the box was written: "Insufficient Memory for this Operation." I couldn't help but smile. I can absolutely relate! People of Expanding Consciousness (P.E.C. 's) are constantly complaining in 3D about feeling "spacey" and experiencing problems with short-term memory. I wonder how many of us realize where all that "memory" is going? We are literally building Bridges Across Consciousness - Transit Points between "here" and "there," wherever one might wish that to be. These Bridges do not exist outside ourselves. They are Arcs of Energy which join waking consciousness with all other consciousness everywhere. We are all part of the same one Being. The primary benefit for exploring linear continuity in 3D is not the creation or resolution of problems. Those things happen, of course, but they are not the real reason for our participation here. Neither is it our personal dance of experience, which is also a wonderful thing. The Reconnections tell us that the lives we are living here have already completed themselves, in a multitude of ways. They are productions that are "in the can," as we say in the movie biz, waiting for their release. We are simply walking through them now, in the presence of our Expanded Self, focusing on our technical skills as creators. This little insight was released for mass mind consideration in the second "Matrix" movie, in a conversation between Neo and the Oracle. And there is much, much more to the story. In my own Astral Journeys thus far, I have encountered three conceptual formats for dealing with travels that go beyond physical reality. The first is the Bridge Across Consciousness. There are many mornings when I awake exhausted, as though I hadn't had much rest at all. My body feels somewhat refreshed but my consciousness feels like it just ran a marathon. It is those mornings when I realize I've spent a great deal of my dreamtime out on the Bridge. The second conceptual format is called a "Multidimensional Ship." If a P.E.C. is to continue functioning effectively in form, there needs to be a supra-conscious allocation of energy to administrate his (or her) dealings with The Multiverse. As mentioned earlier in this series, this energy is referred to as "The Pilot Self." 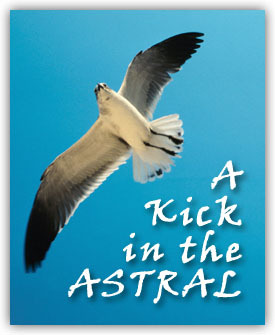 There is much interest and excitement around this experience, known as Astral Travel - connections, remembrances, focused intent - all of which have power to provide for you an instant interface with the Multidimensional Self. We have been offering you this information in layers, so to speak, so that your consciousness can upgrade itself naturally, and in total conformity with the itinerary which you, yourself, laid down when you began your human existence. Each tone, each idea we provide, will produce its own special "journey" within. And there is no need for you to miss a single one! Welcome aboard The Multidimensional Ship! Its observation deck is your entire perceptual reality. And it is now in motion. YOU are now in motion. If you only realized how fast you were going, you would probably feel a bit ill. In truth, many of you are currently experiencing signs and symptoms of what we call Global Acceleration Syndrome. We provide this title to honor your medical paradigm, even though it is not any kind of official medical diagnosis. Muscle aches and pains, lethargy, fatigue, spacey-ness, panic attacks, depression, insomnia, memory-loss, confusion - these are just a few of the uncomfortable side-effects produced by the incredible velocity at which you are traveling. Your world appears to continue as it always has because your mind requires this in order to keep from flying apart. Your anxiety and hesitancies are the same feelings shared by those who sailed with Columbus. Bound for a new world, they trembled as they sailed, believing their world to be flat. Even so, many of you also tremble - certain that you may "go over the edge" at any moment! Spaceship Earth is a Holographic Being. Structurally, it is like a gift box that some imaginative person sends you for Christmas. When you remove the lid, you find a slightly smaller box, fully wrapped, just like the first one, containing another (even smaller) box, which contains yet another, and another, and another... all the way down to your one-celled creatures. Each "level" of your Ship contains all of the basic elements of every other "level." Some of the features are minimized, in certain aspects, so that others can be maximized and focused upon. But it's all there! And it's all synchronized, like moving parts in a pocket watch. It all blends together beautifully. The system of communication that is in operation between The Pilot Self and The Ground Crew aspect is a toggle function, which refocuses awareness back and forth between 3D and the Expanded Realms. This toggle function is known as "Phase Shifting." We could liken it to the multiple cameras functioning in a TV studio. The director's booth at a TV station has many screens, receiving input from several cameras. Each image on the wall is an actual image of what is happening, although they each come from different angles. Changing from camera "1" to camera "2" is a simple matter for the Director. Meanwhile, the audience stays still, even though their perceptions have changed drastically. You must now realize that YOU are that director, even as you are the audience as well. In the first step of your Return to Oneness, a person is washed clean of all specific identifications with his current base of reality. This is not accomplished by denying said reality. Rather, it is accomplished by remembering his or her involvement with all other realities as well. This willingness to leap into a veritable abyss of possibility, clearing oneself of any "silver cords" or other such protective devices, provides the vibratory momentum needed for transport into any other reality. Do you think you are something? Then you are attached to what you think that you are. Do you think that you are nothing? Then you are attached to what you think that you aren't. It's only when you realize that you are everything that you can finally let go. Phase Shifting mixes and mingles Earthly Reality with that of the Pilot Self. It is a continual movement, back and forth, between the mundane focus and a magical voyage we are each taking to points beyond imagination. Both actions are simultaneous, occurring at different levels of vibration. The toggle action in the mind is so rapid that many P.E.C. 's do not even realize it's happening. If the reader has ever done study into subliminal advertising, you will probably identify more clearly with what I am describing. It isn't exactly the same thing, but similar. The primary dichotomy being transmuted here are the twin concepts of waking and sleeping. Many P.E.C.s complain of frequent bouts with insomnia - finding themselves awake in the middle of the night and sleepy in the middle of the day. This is all part of the process. Just as "dark" and "light" are now becoming one, so are the concepts of waking and sleeping. One cure for the anxiety surrounding insomnia is to stop, during your nightly journeys around the house, and say to yourself: "I am asleep and dreaming. I will awake in the morning well-rested and refreshed." Do this several times, and go about your business. It works marvelously. After all, it's all our own creation, right? The concept of dreaming and dreams covers our Limitation Consciousness from fully comprehending what is happening when we make these excursions into The Multiverse. We take flights of fancy, and refer to them as daydreams in order to keep a firm foothold on what we believe is "real," and what isn't. When we journey out in this way, we say: "Oh, it was just a dream, a whimsy..." and we assume that is all there is to it. But it isn't. More and more, humankind is admitting to the vastness of our conscious capacity. As the Guides told us earlier, we didn't just "think up" computers and cyber-technology, as a race. We remembered them from our inner experience of the Expanded Self - the Greater Whole of Us - and down-stepped a tiny sliver of that energy into what looks like a machine. That way, when we get tired of being powerful, we can "turn off" our computer, or we can "wake" from our dream, and return to acting like "normal people" again. But friends, we are so much more than that! to go quietly and safely insane every night of our lives. As this process continues, each person will create exactly the experience he or she needs to form a magnetic link between 3D and the rest of who we are. The appearance of leaving the body is one of them, Trans-Physicality (leaping from body to body) is another, and the Multidimensional Ship is yet another. The point to remember in all this is: we are all one. Each body-mind is "set" to reject an intrusion by any energy that is not part of this Reconnection to Oneness. This means that, before any energy can access someone's mind or body, it first has to attain a state of unity with that person. The above statement regarding our Oneness with everything is very similar to the basic rules of Classic Dream Interpretation. Everything and everyone in a dream symbolizes some aspect of self. To understand a dream, we use allegories or metaphors to link the abstract with our tangible, daily self. This is true whether we are awake or asleep. However, dream figures can get especially dark and scary, if they aren't grounded to some level of reality. So can figures encountered in Out of Body Excursions. We refer to these figures as our "Other." They are Shadows, aspects of self that we haven't quite integrated yet into our personal idea of who we are. When the reflections are favorable, admirable characters and we wish to embrace them with awe and wonder, they are referred to as "Golden Shadows." When they are repulsive, horrible characters who make us want to run away, we refer to them as "Dark Shadows." Just as we're transmuting the dichotomy between night and day, so are we transmuting many other parts of duality as well. Dancing with the Shadow is part of that. Next segment, we'll talk about the third conceptual format I use for dealing with Astral Reality. It is called a Crystal City. As I am writing here, we are moving towards July 7, 2007 (7/7/07). On that day, Nina and I will make a journey to Chehala, the 3D Interface for my very own Crystal City here in Washington State. It is located in the Olympic Mountains, and it fills my soul with new life and vision every time I go there. We discovered this spot on April 4, 2004 (4/4/04) and we took a Conclave to visit there later that fall. The "Others" of Me, who live in Chehala, are always happy when we make this trip! There is a fountain of pure spring water that pours from the mountain, and as I sit and meditate, all manner of images dance through my brain. Or, I am taken up into the City, where various Counsels and Magistrates conduct Multiversal Exchanges. Does this all sound like a video game or a fantasy movie? I hope so. This is what we have in store for us in the days, weeks, and years to come. Thanks for listening. My next series will begin running in September on Planetlightworker.com. It's an updated commentary on "Building the Crystal City." Watch for it. PLW is a fine spiritual publication. To subscribe, click here. The underlying philosophy of Planetlightworker.com is to provide a space for many different flavors of the truth. The views and opinions expressed by the authors of our articles and/or interview subjects are not necessarily those of the editors, management and staff of New Earth Publications. New Earth Publications does not endorse any individual product or concept, but rather, offers this information for your individual discernment. We are happy to receive your opinions and feedback and actively encourage you to send us your views for publication in future issues. Copyright: New Earth Publications, 1999-2007. This © also includes all art, photography and animations (unless otherwise stated). Please contact us if you wish to use PLW imagery.